Writing one good quality new blog post can take days and increase traffic to your product by only 1 to 2%. We’ll show you the exact edits we made to our top blog posts in around 16 hours that increased traffic to our product site by 20%. We used both Google Search Console and Oribi to analyse the posts and found, what now seems like, obvious gaps. Our traffic before we made changes. Our traffic after we made changes. How Google Search Console shows us user intent. How Oribi showed us our highest converting posts and links. The 4 edits we made to increase traffic to our product by 20%. Traffic to blog.upscope.io was around 500 people per day. Traffic to our main product site Upscope.io was around 90 on average. Below, the data covers the unique traffic that comes to the main Upscope product site via the blog and other sources. This first graph is for the period October 15th to October 31st, 2018 before we made any changes. We started analysing the blog posts using Oribi combined with Google Search Console from around the 6th of November and began making changes rather than writing new posts on new topics. I’ve excluded the Thanksgiving week as traffic typically drops off a cliff then. *There was a spike on Thursday but I’m going to average that to the week to keep it relative. This is over 20% but we rounded down intentionally. While we did write further blog posts in that period, they had a minimal overall impact as they were relatively minor blog posts. The main increase came from making changes to our top blog posts and creating 1 new critical post to link into those top blog posts. These top posts bring in 80%+ of our total traffic. What was our rough marketing plan? Write good quality posts on topics in our industry including SaaS pricing, onboarding, live chat and more. Add links, within those posts, that lead to our product site. For example, when mentioning live chat integrations, mention Upscope as one possible integration. When creating a list of onboarding email templates, add our own templates to the top of the list. The more good quality posts we write with well-placed links that help explain our product, the more traffic and sign ups we get to the main product. What dumb assumptions had we made for marketing? In a list post, people mostly click on the first few items in the list. We have enough links at the top and bottom of our posts. Too many would look silly and put people off. Adverts in the middle of lists won’t really work because they look unpleasant, interrupt people and readers are focused on the list. You’ll see below how many of these were proven wrong. In order to analyse what was currently going on, we used 2 tools. The first was Google Search Console. It shows you which if of your blog posts get the most impressions and clicks and what search terms people searched for to get to those posts. The number 1 post on SaaS pricing has had 30,000 impressions on Google in the last month with 1,715 clicking through to the blog post. The average position shown is 22.2 but it actually ranks in the top 5 for many Google searches related to SaaS pricing. What keywords brought people to these posts? We’ll focus on the pricing post which is the most popular post. 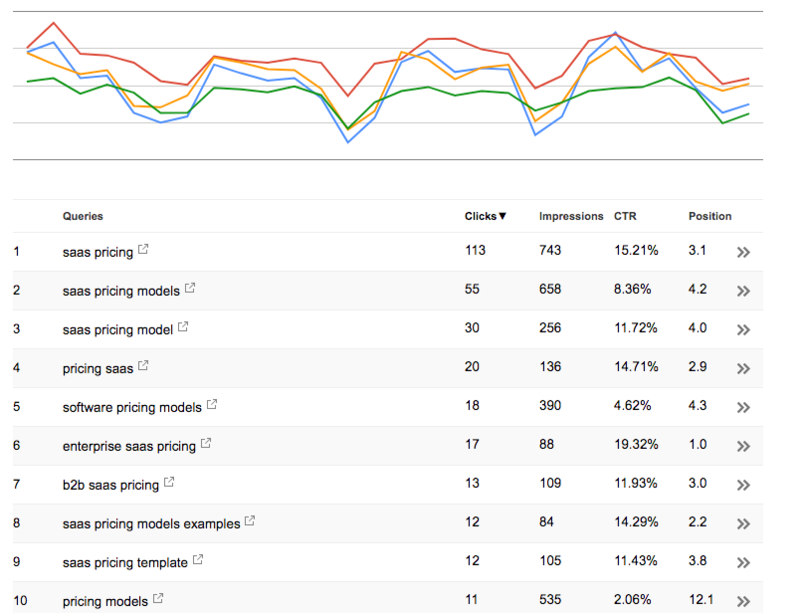 Below are the search terms Google Search Console shows for the pricing blog post. It tells us that 17 people clicked through looking for ‘Enterprise SaaS pricing’. Our blog post was not about enterprise SaaS pricing. Understanding “intent” helped us edit our blog post correctly. We created a separate post for enterprise SaaS pricing and linked it to the top of this pricing post. Oribi is a tool we can’t live without now. It’s exactly the right tool for doing content marketing that converts traffic into sign-ups. We’ve tried to use Google Analytics for these sorts of tasks but it’s a mess. We needed a tool that understands content marketers and that’s what Oribi does. We explain it further in this post we wrote comparing the two tools. It’s best to explain Oribi via examples. Let’s say you’ve done a big roundup blog post. What items in that list do users click on the most? This is our pricing roundup. What are the 3 most clicked links? Here’s what Oribi shows us for that blog post. The third most clicked link is number 11 in the list. The second most clicked link “on the best way to price SaaS products“ is the very last one in the list. This was quite a shock. 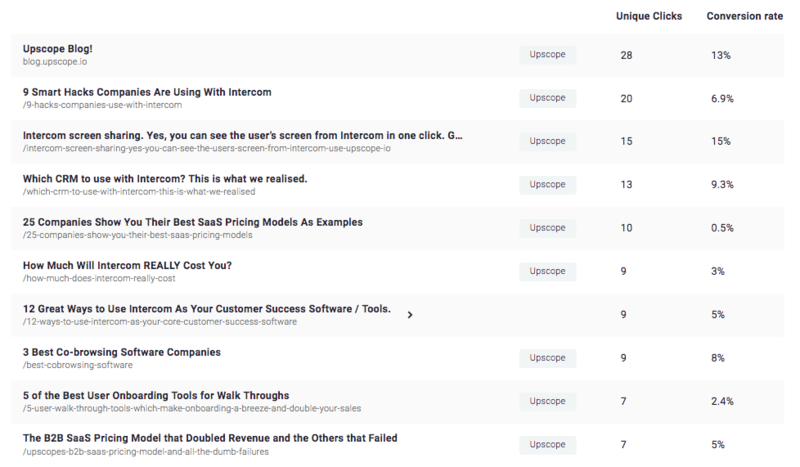 We decided to add our own Upscope pricing blog post to No.1 in the list but hardly anyone was clicking on it. We then changed the title several times and tried to match it to both user intent and follow convention for creating good titles. After a few experiments, it became the most clicked item in the list. Both Oribi and Google Search Console combined gave us a whole world of experiments and edits to make. Here are the exact edits we made. This was done over around 16 hours in total (so equivalent to 2 working days) but spread over several weeks so that we could measure the impact and run further experiments. 1. Oribi listed our highest converting posts. We linked them into other posts as often as possible. These are the posts most likely to bring a user to the Upscope product site. We previously didn’t know which posts were converting well but seeing this makes it seem obvious. Lists of hacks, in which our product is one of the hacks, is bound to do well. We knew this from past experience but had forgotten and Oribi gave us undeniable proof. We added the 9 Smart Hacks and the other high converting posts into as many related posts as possible over and above other previous posts. For example, we linked the most popular post on Intercom to all the other Intercom posts. 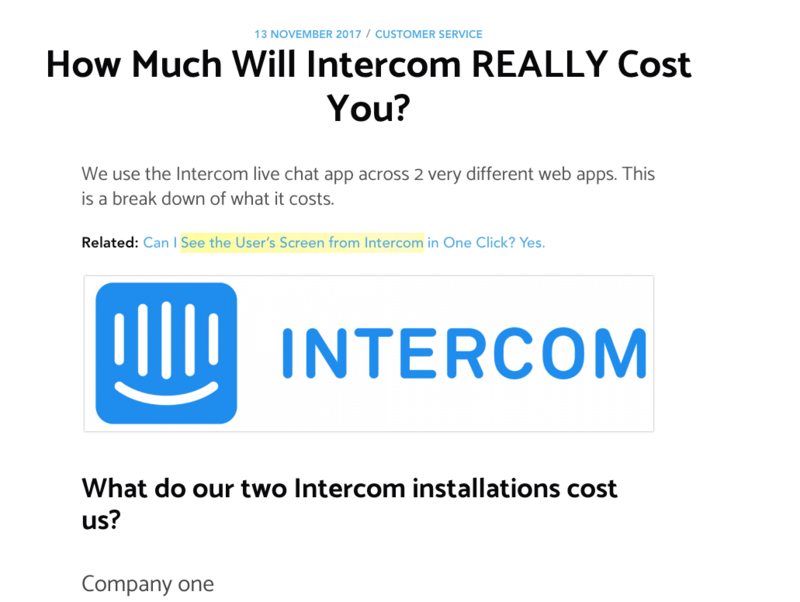 The Intercom screen sharing post was converting well so we added that to all Intercom related posts and even used the inbuilt highlighter to light it up as below. This was one so obvious we kicked ourselves that we had not done it earlier. 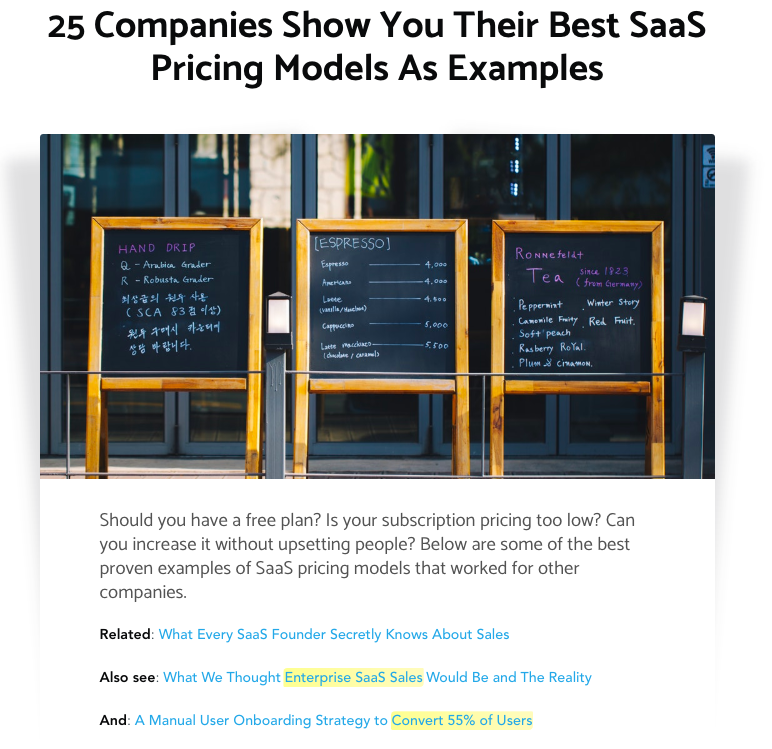 We had created the 25 SaaS pricing models list but had not created and added our own post to that list. We wrote that post about our own pricing adventures and added it as number 1 in the list. As explained above, it took a few experiments with the title to raise the number of clicks on that post but now it’s the top ranking link. 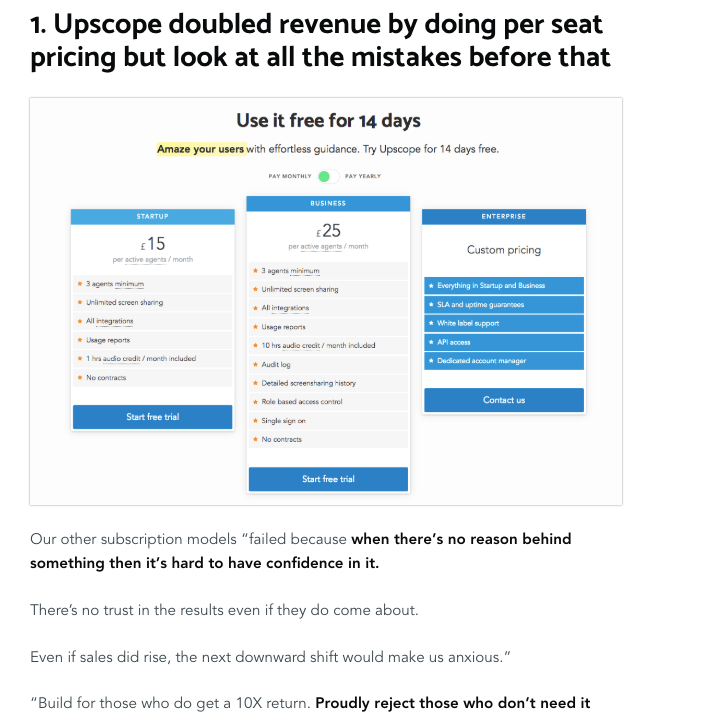 When people read about Upscope’s pricing journey they naturally learn about the product and click through to the site. Previously we’d add one link at the top to a related post, now we typically add 2 to 3. It works, people click on these links. Google Search Console tells us that some people come to this post by searching for SaaS enterprise sales so we added a link to our enterprise sales post at the top. Naturally, it describes Upscope too, without being salesy. The aim of a marketing blog must surely be to increase sign-ups to the main product. It turns out that putting an advert in the middle of our big roundup list is fine. If it’s related to user intent, it works. We thought it would be an irritation but most people are used to skipping ads because the ads are not relevant. A relevant add is useful. We directly inserted a picture and a link to a related post into each of our top posts, 1/4 of the way down the list. 1.7% of all clicks on that page are on that advert. We’ll test different pics and headers, we are certain we can improve that number and the blog post it leads to. That blog post directly sells why people need Upscope. It’s only obvious after the data points it out. We thought we knew how well a blog post was converting and what link was doing the work, then we saw the data and changed our minds. If we have a big list of items in a roundup, they don’t click on the first or even second link, they read through and pick the catchy title and/or the one that best matches their intent. The best converting articles tend to be lists of hacks or tools where we included our own tool because the user intent and the content lined up. Pardeep Kullar is a co-founder of Upscope co-browsing, the new one-click interactive screen sharing for supporting your customers like never before, and long-term user of Oribi.